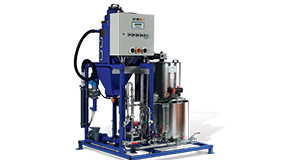 Coal Power Plant | ProMinent Fluid Controls, Inc.
A fully automated dosing and blending system provides reliable, performancebased polymer make-up for critical coal combustible byproduct disposal. 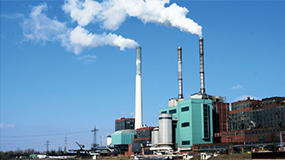 Waste management is a major issue facing the coal-fired power industry, including the management of fly ash, bottom ash and other Coal Combustion Byproducts (CCBs). CCBs from wet scrubbers, which typically include coarse and fine-grained residues, are commonly referred to as bottom ash and fly ash. The increasing difficulty in some areas for obtaining permits for new disposal sites for CCBs, coupled with utilities reaching limits of their existing permitted space, is prompting more and more plants to consider paste technology as a technically viable alternative combustion byproduct management solution. CCBs are managed in dry or moist form and transported off site for disposal (similar to using methods and equipment common to earthwork construction). Alternatively, CCBs are managed in wet form, whereby the ash materials are transported as a dilute slurry by pipeline to a storage compoundment where the waste products settle out and the excess water is either stored or reclaimed. Dry transport and storage of CCBs has the potential to create serious dust issues. Seepage from wet storage facilities is also becoming an increasingly important operating and regulatory consideration for many power utilities. In addition, the water availability necessary for wet slurry CCB management processes is quickly becoming an issue in some regions. Paste technology, on the other hand, converts wet scrubber fly ash and bottom ash slurry from plant exhaust into a material with toothpaste-like consistency. Once formed, this paste, which sets up like concrete, typically goes into holding ponds. Compared to the dilute slurry deposition process of ash products, a system using paste ash greatly reduces excess water storage in impoundments, reduced seepage losses, and increases storage efficiency. The success of the paste process is dependent upon the level of separation to achieve 60 to 70% dry solids, providing for immediate separation of solids as a paste for disposal and clear water overflow, which can returned to the power plant for re-use. Most paste applications typically start with a dilute slurried waste stream that requires dewatering. Polymer preparation and feed is a critical component in the process. Polymer is added as a flocculent to enhance liquid solid separation and thereby increasing the solids content of the paste. Unless polymer application is complete, excessive polymer will be needed to provide adequate liquid solid separation. Optimizing flocculent feed can bring optimized results to paste plant clarifier performance. However, insufficient initial mixing energy can create polymer fisheyes that contribute nothing to flocculation. In addition, the lack of uniform agitation intensity after initial polymer wetting can allow polymer molecule chains to fracture, resulting in ineffective flocculation. A large coal-fired power plant located in the Northwest region of the U.S. recently converted from a wet slurry processes to paste technology and has achieved very good results. 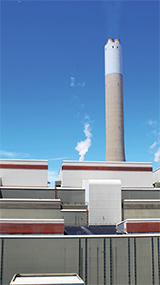 The plant is environmentally permitted as a zero discharge facility, meaning all residuals from the process, including water, must be contained within the power plant grounds. Two satellite paste plants were recently built by the utility to convert wet scrubber fly ash and bottom ash slurry from plant exhaust into paste. 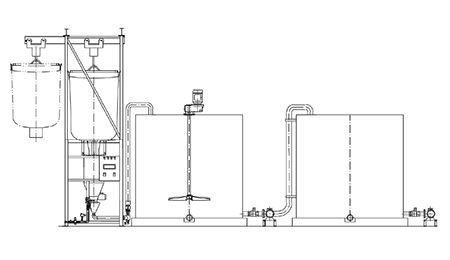 The utility’s original paste plant’s first polymer feed system used totes to deliver dry flocculent onto a feeder, where compressed air blew the flocculent into a prep tank equipped with a mixer. From the prep tank, the hydrated polymer went into a stock tank and then dosed into the clarifier. When the second paste plant was being designed to serve the power utility, the utility and its water treatment consultant determined a better polymer preparation and feed system needed to be installed. The system ultimately selected, a ProMinent PolyRex Polymer Makeup Unit, is a turn-key automatic machine for batch preparation and metering of polymer solutions that can feed an adjustable flow of powdered or liquid polymer plus provide adjustable flow of preparation and dilution water. The system included all tankage and components. The new system uses a 3-step mixing regime to effectively hydrate and mix the polymer to a homogenous and fully activated solution. The first step is the hydration system, where the polymer is fully wetted. This initial moment of contact between polymer and water is critical because poor initial wetting can increase aging time significantly. In the second step, energy is added through acceleration in the water ejector. The successful dispersion of polymer fisheyes is achieved through the deployment of high energy within the first milliseconds after initial wetting. The third step is the efficient but gentle agitation in the mixing tank, allowing for the full extension of polymer chain molecules. With this 3-step regime, polymer particles cannot pass the process without being activated. The new polymer make-up unit serving this paste plant has performed very well since startup. The multiscrew polymer feeder ensures reliable pulsation free discharge with high metering accuracy and the unit’s static mixer optimizes the post dilution water sequence. Using an overhead crane, a single operator installs the 2,000 lb. bag that feeds the unit. The dry polymer is fed to the unit hopper through a neck extending from the back. The multi-screw feed system at the bottom of the hopper runs for a predetermined interval until it has dispersed the precise amount of polymer required for the batch. Due to the safety and efficiency of the polymer system at its newest paste plant, the utility elected to also replace the original polymer feed and make-up unit at its first paste plant with a PolyRex system. The new system was retrofitted using much of the plant’s existing tankage and went on-line in early 2012. The paste plants allow up to 95% of the inflow water to be pumped directly back to the utility for reuse, thereby significantly reducing the need for a major source of water inflow to the power plant. Because of the batch-to-batch consistency provided by the new polymer units, operators are able to account for 99 percent of the weight in every super sack of dry polymer used. These consistent results increase the efficiency of plant operations as well, so that the entire process is carried out rapidly and effectively.